Cash In On Your Spare Time As a Globetrotting Travel Consultant! I have a level of freedom that I never had before. I can make my own hours. I don't have to report to anyone. It's the best decision I've ever made. …and getting paid for the experience. …and not paying for ANY of it. That's because YOU'RE the one getting paid for the pleasure! …and earning enough income every step of the way to pay for your incredible adventure. But I assure you, this is the REAL DEAL! And many profit-minded world travelers are already getting in on this. Cindy M. loves France, but used to only visit on vacation. Now she makes anywhere from $3,000 to $10,000 every time she travels there. And even if she stays at home, and helps someone else go to France, she can still make money. Greg A. helps people explore European cities like Prague and Munich… and makes up to $8,000 every time he organizes an overseas trip. And in the next few minutes, I'm going to show YOU how you can take advantage of this opportunity to become an in-demand Travel Consultant in a surprisingly short period of time. So… What Does A Travel Consultant Do? Basically, you get paid to help other world travelers plan their overseas trips. And then, if you want, you can also join your fellow travelers on the amazing adventures you arrange. How You Can Score FREE Hotel Stays, FREE Meals, FREE Tours And More! One of your main responsibilities as an established Travel Consultant is to arrange the most important aspects of your clients' trips. 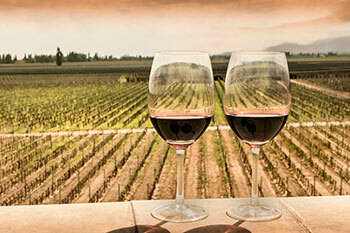 This includes making flight reservations, hotel reservations, restaurant reservations and booking tours. And once you start sending a regular stream of people to any particular business, they'll often offer you incentives to continue sending them consistent business. In fact, more often than not, they'll even offer you FREE vouchers that you can use once you send them a certain number of paid travelers. 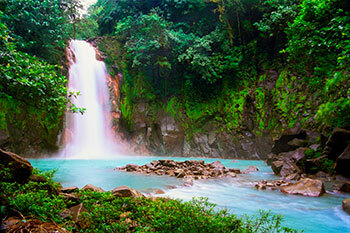 For example, let's say you've got 9 people all participating in the same half-day, four-wheel jungle tour of Costa Rica. Play your cards right, and the 10th tour will be all yours, for FREE! Same goes for many other bookings you make—including hotel stays, restaurant reservations and more! It's not difficult to learn how to do this and do this right. Yet despite its simplicity, this opportunity can provide ANY traveler (including YOU) with a virtually endless number of fun, exciting AND profitable adventures all over the world. That's why this is one of the most promising "make money anywhere" income opportunities of 2018 and beyond. I'm sure you'll agree…most seasoned travelers would gladly pay hundreds, even thousands of dollars to enjoy these types of "bucket list" activities. But you not only enjoy these kinds of activities for FREE, you get paid to enjoy them! It's like getting paid to spend your days on vacation. And it's a whole lot easier to get in on this "make money anywhere" opportunity than you might think. This opportunity does NOT require any advanced qualifications. And you don't even need to leave home to make money as a Travel Consultant, if you don't want to! You can do this from home…from a pied-à-terre in Paris…from a postcard-perfect beach on a tropical island in Thailand…anywhere you want to be! And like I said, you already have most of the skills and experience you need to do this from anywhere in the world. …then I assure you, you can do this. My name is Jackie Flynn. I'm the Publisher of International Living. And today I'm going to show you how YOU can start a new part-time OR full-time gig as an in-demand Travel Consultant as soon as TODAY. But right before I do that, here's how a few of your fellow world travelers are already profiting from this highly promising income opportunity. Remember, this could be YOU! Back in 1993, Matt B. was working for a U.S. tourism company in India. There's a common misconception that only the younger "Millennials" and "Gen Y" travelers are ideal candidates for this moneymaking opportunity. And this couldn't be further from the truth. And yes, while it's true you DON'T need any experience to get in on this opportunity, the simple fact you may be "older" can be an absolutely HUGE advantage, thanks to your life experience and interests alone. Combine that with the ease of doing business and booking online, and it's never, ever been a better time for Baby Boomers to get in on this opportunity. He always loved both travel and photography. However, he only took photos as a hobby…and not to make money. Then, one day, he realized there was a market for people who wanted to take photos in places like India, Mongolia, and elsewhere in Asia. He discovered many people simply didn't know how to take great travel photos or where to take them, and could really use some "expert" help. So he started his own business helping people take photos of Asia's most exotic locations. "When you're living in another country, exploring is part of your daily life," says Matt. "So when it came to the tours and workshops, I knew where to take people, especially from a photographer's standpoint." Today, Matt's business is a smashing success. He charges as much as $6,500 per person. And the tours he creates and organizes regularly sell out. In fact, Matt's business is doing so well, he recently rented out a five-bedroom house in the world-class retirement destination of Penang, Malaysia, where he now lives with his family. Their home is within walking distance of one of Penang's famous hawker centers. Here, they can eat all the dishes that put Penang on the foodie map: Indian curries, ginger and soy steamed fish, silky Chinese noodle dishes—all for only a few dollars each. "I love the ease and quality of life here, especially the low cost of living," says Matt. "Plus, it's so easy and cost effective to run my tours from here." "Anytime we feel like it…we hop on a cheap flight to Vietnam, Bali, or the Philippines. We just came back from a trip to see the komodo dragons on Komodo Island, Indonesia." "It's just amazing. We've seen so much of the world." When Amanda P. and her husband Youssef moved from the U.S. to Marrakech, Morocco with their children, setting up a business was not on their minds. However, in 2013, shortly after arriving in her husband's hometown, the Wisconsin native came up with a new business idea. "We were sitting in a café watching tourists go into overpriced restaurants that we knew had terrible food, and the idea crossed my mind of offering a food experience to visitors," says Amanda. 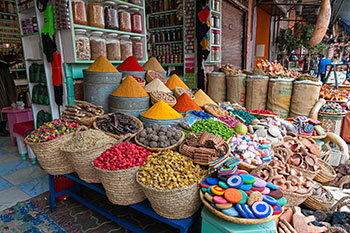 Traditional Moroccan food is famous around the world for its mouth-watering flavors and fragrant spices. Slow-cooked lamb and beef tagines, light fluffy couscous and colorful vegetables, juicy kebabs, flaky nut-filled pastries dripping with honey. Only someone like Amanda and her husband, with insiders' knowledge of the city, could show tourists the best places to sample local food. So she decided to set up a business that would help visitors experience the very best of Moroccan cuisine. And when her business opened, it became profitable almost immediately, and rapidly proved to be a smashing success. What's more, Amanda and her husband launched their super-successful business on the smallest of shoestring budgets. "We had very little money to invest into a business, $50 to be exact," recalls Amanda. But that didn't stop their new business from growing. She's added several new itineraries since the company's launch. Within three months she was able to hire a U.S.-based assistant who helps with reservations and invoicing on a part-time basis. They've also hired local guides, to give them more time and freedom. "Hiring local guides has helped us grow and expand and added flexibility to our schedule," says Amanda. "We want to have the flexibility to move around and travel freely." Back in 2008, Greg A. was working at a media and design college in Seattle, Washington. And while he was there, he wanted to introduce the students who attended the college to the wonderful world of international travel. So he decided to organize a trip to Berlin, Germany. Turns out his students loved overseas travel. And it also turns out the service he provided was incredibly valuable, too. "They were becoming better and more aware citizens of the world right in front of my eyes," he recalls. "From that moment on, I was hooked on connecting people with opportunities to grow in those ways through travel." Since then, Greg's organized 24 trips in 11 countries. 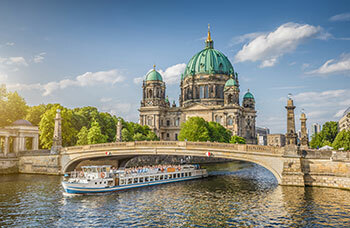 He's helped travelers of all ages explore world-class destinations like Prague, Munich and Budapest. And he now profits up to $8,000 per trip! If one thing's for sure, Greg sure loves his fulfilling global lifestyle. "I get to revisit my favorite places and take people there to share my excitement and knowledge of the destination," Greg says. "At the end of the tour they suddenly realize that the world is not as big, scary, and anonymous as they thought at the start. They discover something about the world and themselves and that is something cool to be a part of." We've also heard plenty more success stories from other successful globetrotting Travel Consultants already "living the dream" overseas. When you're a Travel Consultant, you don't have to move overseas to make great money. In fact, this is something you can do as little as one week (or even just a few days) per year if that's all you want to do! And it's all up to you how you want to run your tours. So if you'd like to stay home for the majority of the year, and perhaps run a short weeklong tour to the Caribbean in December or January, you can absolutely do that! If you want to organize one tour per year to Rio De Janeiro, Brazil for the carnavale celebrations for a few weeks, you can do that, too. You could even do just one weekend tour per year to nearby Cabo San Lucas, Mexico for a bit of golfing, fishing and relaxing. And you can organize all of this from home. That's because these days, it's easier to arrange trips from home via the internet than ever before. Of course, it will help you tremendously if you have intimate "insider" knowledge of an area that interests you. But you don't have to live full-time in that area to do this. So please, don't worry if you think you have to quit your current life, sell all your belongings, and move overseas to make this happen. You CAN do this without making ANY major "full-time" overseas moves. Making money enjoying Colombian coffee and cuisine. Nicole F. and Jeremy H. help others discover the very best of Colombia's tasty local cuisine and world-renowned coffee. No matter what you dream of doing, this is a way you can leverage your interests into a real, bonafide way to make money from anywhere in the world. This opportunity to make money from anywhere you decided to base yourself—overseas or at home—is also incredibly FLEXIBLE, you can choose to do it for as little as one or two weeks a year if you want. And STILL get paid for it. Think of it as getting a "free overseas vacation" for just a few hours of your time. Or, if you want to take things even further, you could even turn this into a full-time income stream AND get paid year-round, living full-time in a world-class overseas destination and doing the things you love whenever you want. Yep, you can do that too. 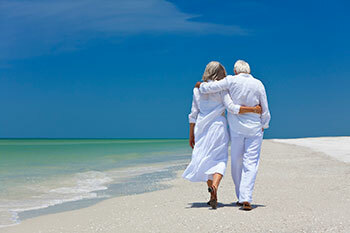 When You Take A Trip, What Are The Activities You TRULY Enjoy And Would GLADLY Pay To Do? Do you enjoy participating in water sports like swimming, snorkeling, scuba diving or surfing? Do like "cultural" activities like visiting art exhibits, museums, temples, and UNESCO World Heritage Sites? Perhaps you love food, and you just love to try out as much tasty local "street food" as you can whenever you visit your favorite place away from home. Is that what you love most when you travel? … I'm here to say that with the right help you can earn great income organizing and participating in activities just like this. Take advantage of this opportunity and you really can GET PAID TO DO WHAT YOU LOVE, simply by helping other like-minded travelers enjoy similar experiences. And remember, you don't even need to leave home OR move overseas full-time to get in on this opportunity ALMOST IMMEDIATELY. Tara's originally from Salt Lake City, Utah. And ever since she was a young girl, she's always been intrigued by the idea of making new and exciting discoveries when she travels. That's one of the biggest reasons she decided to spend two years living and working as a Peace Corps Volunteer in Central America. And while she was there, Tara got the chance to fulfill her lifelong dream of enjoying some of the most amazing adventures you can possibly imagine. Tara also made sure to invite her friends and family to join her on some of her adventures. It was simply too great of an experience not to share with others. And when her friends and family joined her, and got the "inside scoop" on her finest discoveries—thanks to Tara's intimate knowledge of the area—many of them exclaimed, "they had no idea these cool places even existed." Soon, Tara began looking into whether she could do this to support her lifestyle. If she could actually make a living helping others arrange incredible overseas adventures with her inside knowledge of the destinations she knew about. And as it turns out, this opportunity to help others explore and experience the world in grand, exciting style was more wide open than Tara could ever possibly imagine. So she dove in head on and gave it a shot. Her life hasn't been the same ever since. 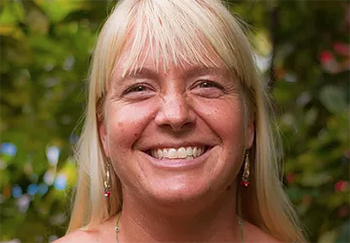 Over five years later, Tara now lives full-time in tropical Costa Rica and enjoys an absolutely incredible lifestyle…and makes a full-time living helping others enjoy adventures in and around her new adopted home country. She even earns enough income from her travel experiences to fully fund her life in Costa Rica…and save some money while she's at it! YOU Can Enjoy The Same Kind Of Exciting And Profitable Lifestyle—With Tara's Help! Last year, I asked Tara to compile all the insider secrets that she and so many other successful Travel Consultants rely on to make great money from anywhere in the world. We've just put the finishing touches on an all-new resource that reveals EVERYTHING you need to know to become a successful Travel Consultant as quickly, easily and hassle-free as possible. It's called The Insider's Guide To Becoming A Well-Paid Travel Consultant. And I couldn't think of a faster, easier, more effective way to become a successful Travel Consultant than by having this all-new resource right at your side. And many, MANY more "secrets" of becoming a successful Travel Consultant you simply won't find anywhere else. Some travelers, especially large groups, could still use help arranging their travels and finding the best deals. You can help them do just that. Armed with the insider how-tos you need, you'll understand exactly how you can get paid to enjoy the sort of experiences you'd gladly pay for yourself. Take people to Kyoto, Japan during April and May, so the photography enthusiasts in your group can take epic photos of Japan's world famous cherry blossoms right at their peak. And in the evenings, show them where they can enjoy the finest sushi and sashimi, Kobe beef, Japanese noodles and green tea ice cream! Whatever you dream of getting paid to do, you could make it happen. And whatever amazing experiences you may have in mind, you can transform those experiences into a lucrative income as an established Travel Consultant. And you could start getting paid fast, even if you're still based in the USA or Canada. In fact, you don't have to move overseas to earn this way. 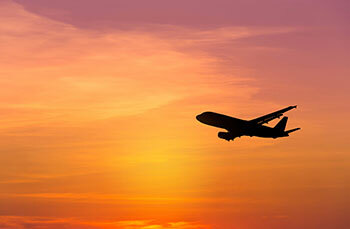 All this and more is what you can expect once you become an established Travel Consultant. And there is no better way to get started today than with The Insider's Guide To Becoming A Well-Paid Travel Consultant. I could reasonably charge at least $500 for the insider intelligence and how-to guidance The Insider's Guide To Becoming A Well-Paid Travel Consultant delivers. After all, if you can earn as much as $10,000 from a single overseas trip you arrange, this resource would pay for itself many, many times over in just a week or two! I'm not going to charge anywhere near that much. Because I really want you to take a closer look at this great opportunity, you can get your hands on this program for $149 right now. … I'm going to throw in not one, but TWO SPECIAL BONUSES to help you become a successful Travel Consultant as quickly, easily, and hassle-free as possible. I've already mentioned that you can GET PAID WELL as a Travel Consultant. And I've also mentioned how it's possible to earn as much as $3,000… $5,000… $8,000 or more from a single overseas trip. After all, we know other Travel Consultants already earning this much! 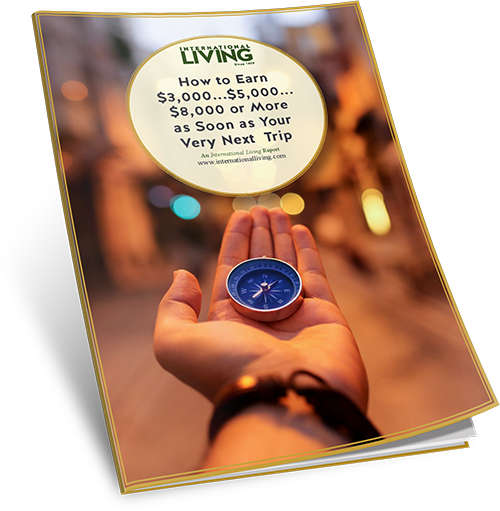 And in this Special Report, How To Earn $3,000… $5,000… $8,000 Or More As Soon As Your Very Next Trip, you'll get a quick overview on EXACTLY how to do it—straight from the "insiders" ALREADY doing it! Travel Consultants have an almost limitless number of possibilities when it comes to what kind of tours they can arrange and run. So when it comes to deciding what kind of tour is best for you and your interests, it can be hard to know where to start. Should you do outdoor adventure sports tours? Take people to world-renowned festivals and events? Host eco-friendly or educational trips? Like I said…it's hard to know where to start! The good news is, with this Special Bonus, 66 Fun And Profitable Tour Ideas For Budding Travel Consultants at your side, you'll have dozens and dozens of ideas to consider for your fellow travelers. This will help take some of the "guesswork" out of deciding which kind of experiences will be best for your interests. BOTH of these Special Bonuses are yours when you order The Insider's Guide To Becoming A Well-Paid Travel Consultant today for just $149. Everything included in this special offer comes in a convenient PDF format. This means you'll be able to read everything on your computer, laptop, or tablet anywhere in the world you may find yourself. With The Insider's Guide To Becoming A Well-Paid Travel Consultant in hand, you'll have EVERYTHING you need to know to become an in-demand, highly-paid Travel Consultant so you can start earning income doing the things you love most…from wherever in the world you want to be. Not many income opportunities give you this kind of freedom AND income potential. And the chance to have so much FUN doing it! But this opportunity does all this and more…. And there's no better way to get started than with The Insider's Guide To Becoming A Well-Paid Travel Consultant at your side. Just take a look. 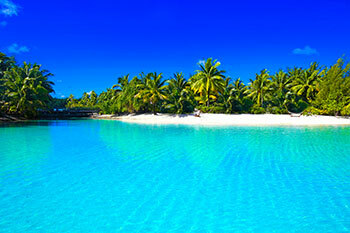 Check out The Insider's Guide To Becoming A Well-Paid Travel Consultant from front to back…. Go through ALL the sections. FIND OUT FOR YOURSELF how EASY…and how REAL this opportunity to make money as a Travel Consultant really is. And make sure to check out the two Special Bonuses, too. You'll likely get more than a few profitable ideas from those two bonuses alone! You've got nothing to lose for giving The Insider's Guide To Becoming A Well-Paid Travel Consultant a test-drive. You Can Check Out This Opportunity To Become A Globetrotting Travel Consultant 100% RISK-FREE! …then I strongly urge you to give The Insider's Guide To Becoming A Well-Paid Travel Consultant a try today. In fact, we're so confident you'll be impressed by everything you'll discover in this all-new resource that we're going to give you 30 days to explore it without risking a single penny. And then, if you decide that The Insider's Guide To Becoming A Well-Paid Travel Consultant is not for you after all, then just let us know within 30 days and we'll refund your money in full. No fuss. No quibbles. No questions asked! We want you to be not just happy, but thrilled with what you find inside. And if you're not—for whatever reason—we'll buy it back from you. If the idea of exploring and experiencing all the greatest wonders the world has to offer—and GETTING PAID WELL to do it—then you seriously owe it to yourself to take advantage of this 100% risk-free offer right now. Once you discover just how DOABLE and REALISTIC this opportunity is, you'll probably wish you got in on this much, much sooner. 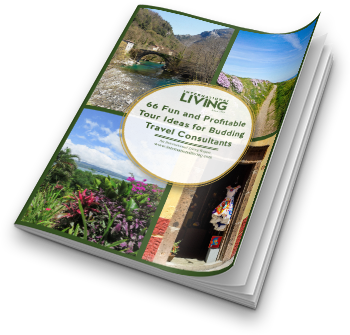 Take a risk-free look at The Insider's Guide To Becoming A Well-Paid Travel Consultant now…and find out how YOU can get paid to enjoy truly authentic overseas experiences almost immediately! To order, simply click "Add to Cart" below and follow the instructions. Click here to go back to top and click "Add To Cart". You've got nothing to lose…and so much to gain. P.S. In just a few short months or less, you could be GETTING PAID to enjoy and experience truly unique, authentic experiences as a well-paid Travel Consultant! You don't need any previous experience. You don't need any specialized skills. And you don't need to be rich to get started. But you will need to TAKE ACTION if you want to get in on this. So what's the best first step? 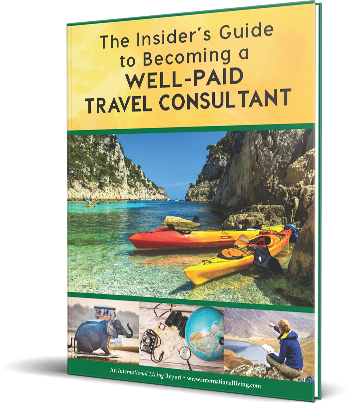 Order The Insider's Guide To Becoming A Well-Paid Travel Consultant NOW and you'll discover everything you need to know to earn great income exploring and experiencing the world in style! P.P.S. Don't forget, you'll also get TWO SPECIAL BONUSES through this special offer. And of course, this is a RISK-FREE offer, too! You've got nothing to lose and a whole lot to gain! Order now!